If you are fortunate, there are places life takes you that stay with you long after you have left. Brooks Lake Lodge & Spa is just such a place for my family and me. Akin to keeping that sweet fishing spot our little secret, for years we refused to share too many details about this high-country wonder. One year, our Christmas card photo prompted friends to inquire with awe at the beauty of the place: “Where is that?” We answered vaguely: Wyoming. For a decade our family of four has traveled from Florida to this remote, historic lodge that is about halfway between Grand Teton National Park and the small town of Dubois. 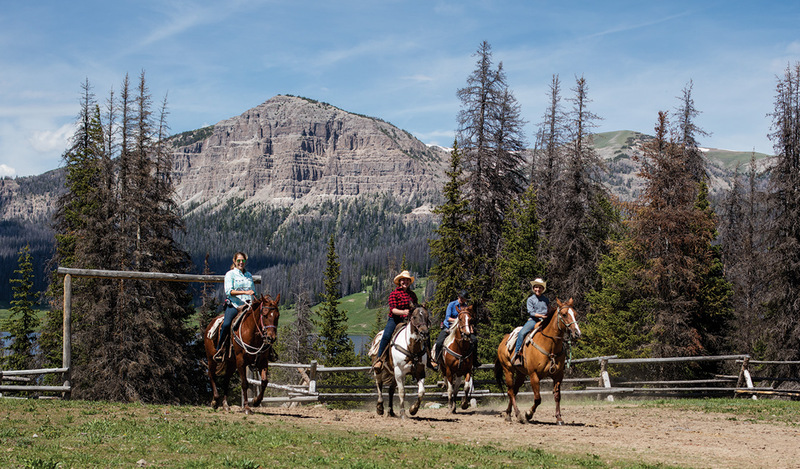 Nestled in a mountain cirque at 9,200 feet, the resort rests within the secluded Shoshone National Forest. Situated on the Old Yellowstone Highway, Brooks Lake was named after Bryant B. Brooks, the seventh governor of Wyoming who discovered the lake and surrounding area in 1889 on a hunting trip. Built in 1922 and named Togwotee Inn, the lodge was a stopover for weary travelers en route to Yellowstone National Park, which was celebrating its golden anniversary. In those days, the train station in Lander, Wyo., was the end of the line. 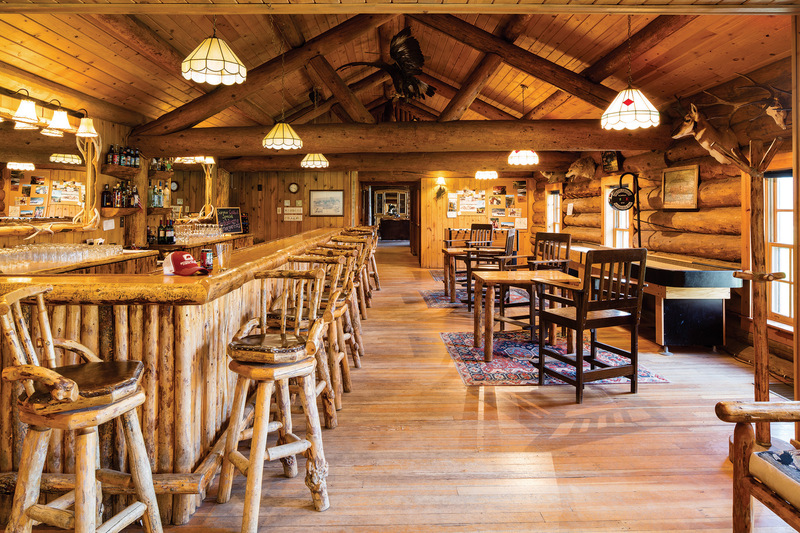 The Lander-Yellowstone Transportation Company partnered with Eugene A. Amoretti, a longtime resident, prominent businessman and owner of the Amoretti Hotel and Camp Company, to build the lodge. Amoretti also built the iconic Jackson Lake Lodge that same year, which was the first modern lodge in the valley. The original lodge foundered due to lackluster profits and went through many transformations over the decades. Ultimately, it fell into disrepair and closed before being rescued in the 1980s and ultimately renovated to its rustic grandeur. Now fully restored, the lodge is listed in the National Register of Historic Places. It has been owned for the past 15 years by pilot Max Chapman, who can be spotted high above the property in a B-51 Mustang, tilting his wings in salute to the lodge. Many guests return here year after year and when they do, general manager Adam Long is there to greet them. He began his career at the lodge guiding hikes as a young college grad. He and his wife Julia (they met when she began working here, and eventually held their wedding on the property) are always welcoming and accommodating. Adam is still happy to accompany guests on a hike or fishing excursion. All runs smoothly and no request seems off-limits. Guests experience each day tailor-made to their wishes. The choices are an outdoor-enthusiast’s dream: fishing, horseback riding, hiking, canoeing and archery. 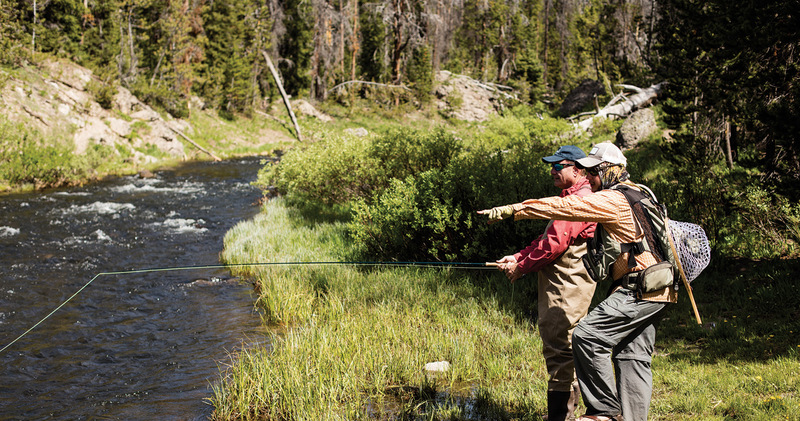 Last summer, we chose to immerse ourselves in fly fishing. Up here, the fishing options are plentiful. Ride horseback to Upper Jade Lake, Lower Jade Lake, Upper Brooks Lake or the aptly named Rainbow Lake to throw your line at those trout hiding just below the dark blue-green surface. Hop in a canoe and paddle Brooks Lake for a more leisurely fishing excursion. 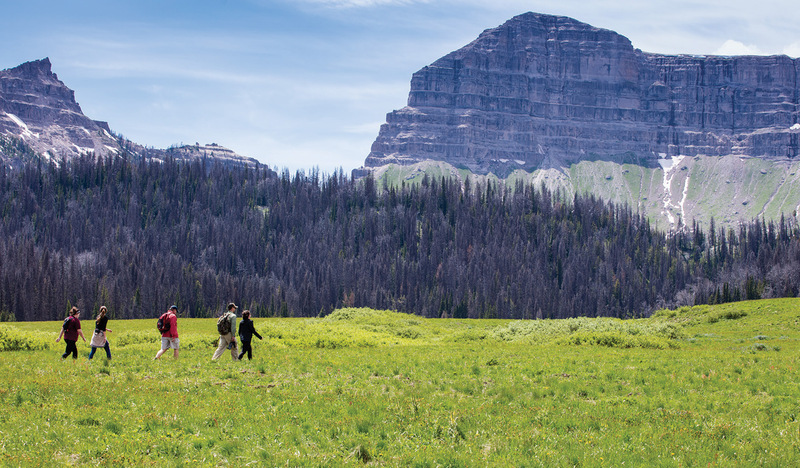 For a different experience, settle into a personal fishing float tube and try your cast in the Wind River Lake, the headwaters of the famed Wind and Big Horn rivers. At the end of each adventure, the comfort of the lodge awaits. The front of the main building is flanked with giant logs and a patio made of river rock, where plenty of Adirondack chairs and cushy outdoor sofas welcome you to sit and take in the views. Just inside, the historic tearoom is home to an impressive stone fireplace, which is always kept burning. Tea is served every afternoon with fruits, cheeses and cookies. The fireplace shares a chimney with the dining room, adding warmth and beauty to every amazing meal. Majestic oil paintings by contemporary Western landscape artists Clyde Aspevig and Scott Christensen fill the walls of the great hall. Just off the tearoom is the Diamond G Saloon, a family-friendly hub where games of checkers, darts­, table shuffleboard and foosball become lively. The carved wooden stools offer a comfortable place to slide up to the pine bar that stretches along the length of the saloon. 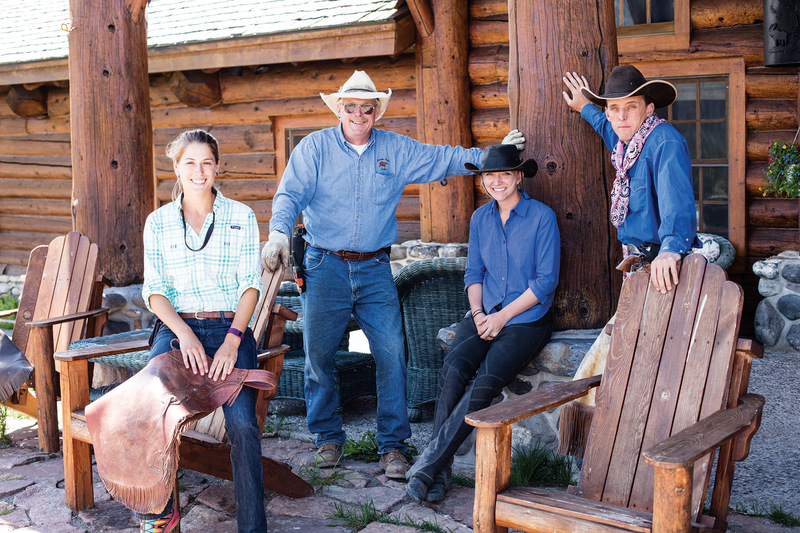 A gathering place both before and after dinner, here guests and staff share drinks and swap stories, creating instant bonds over the excitement of a caught trout, an exhilarating horseback ride or summit attempt. These shared moments are what make the lodge experience singularly superior. Just as important as all the activities is mealtime. 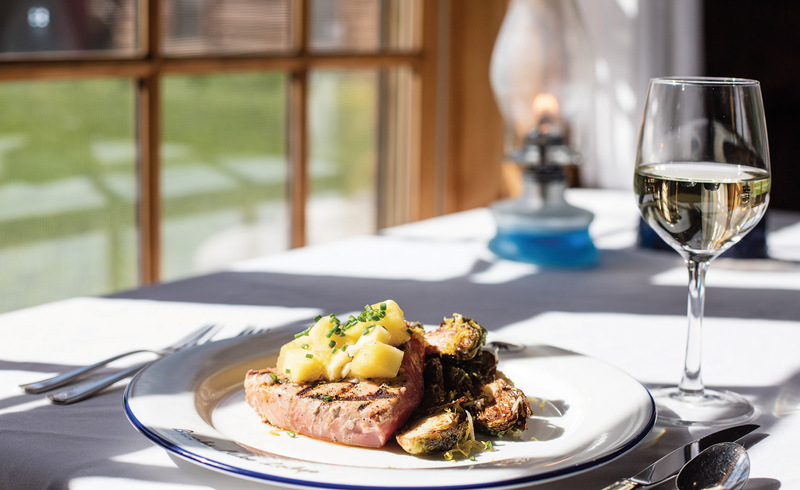 It’s not wise to miss the gourmet meals here, and there are three served each day: a full Western breakfast, mouthwatering lunches and dinners that rival any high-end dining experience. Chef Whitney has served up masterful menus for years now. Her bison tenderloin with wasabi horseradish sauce, a personal favorite, is just one of the delectable choices. Choose between entrees of Kobe beef, game or seafood each night. Top it all off with a sumptuous dessert like ganache-covered golden vanilla cake with fresh berry compote or a huckleberry milkshake. Meals are served family style, with the guests seated at long, linen-clad dining tables where instant and long-lasting friendships are forged. 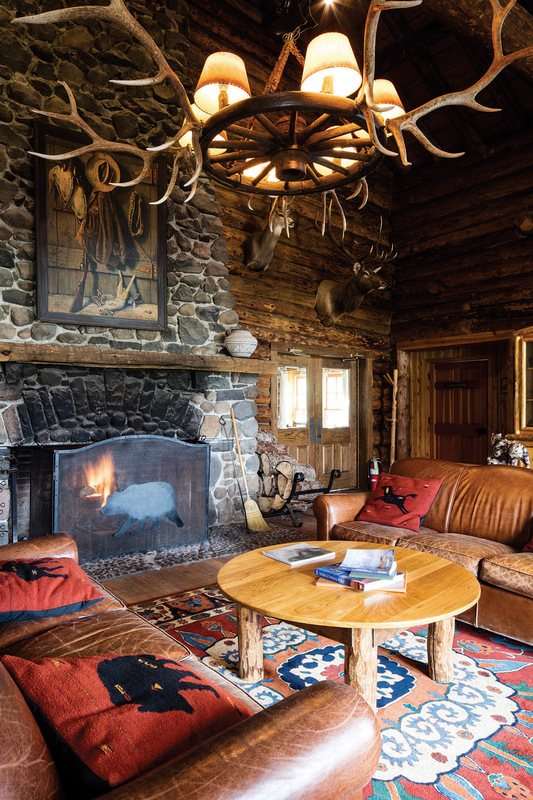 Open year-round, the lodge has seven rooms and eight cabins with fitting names, such as Grizzly, Solitude, Mountain Man, Fisherman and Trail Boss. Each room or cabin is decorated with refined mountain style. Claw-foot tubs, wood burning stoves, cozy bedding, supremely soft guest robes and top-brand toiletries add to the luxury. The spa was added in 2003. 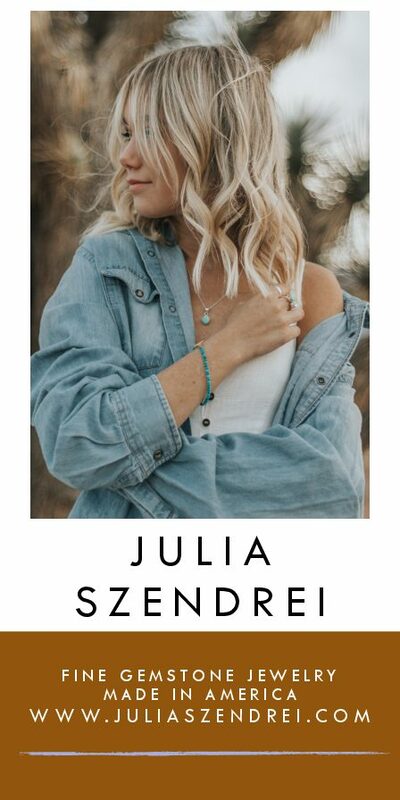 This log building, designed to honor the main lodge, houses a beautifully appointed lounge with stone fireplace, two treatment rooms for massages, facials or other treatments, a fitness center and a dry sauna. Guests relax in the large, open-air hot tub while soaking up the perfect view of the Pinnacle Buttes. It’s inviting after a long day of activities, maybe even more so when the snow piles high around it. It’s not an understatement to say this should be honored with the “greatest view from a hot tub in America” award. Brooks Lake Lodge & Spa will always hold a special place in the hearts of our family and now you are in on the secret: Wyoming. Riding against the backdrop of stunning Wyoming. Guided hikes are offered among the many activities at the ranch. Rustic elegance defines the Brooks Lake Lodge “tearoom,” where a fire burns regularly in a massive stone fireplace and classic wildlife mounts adorn the walls. 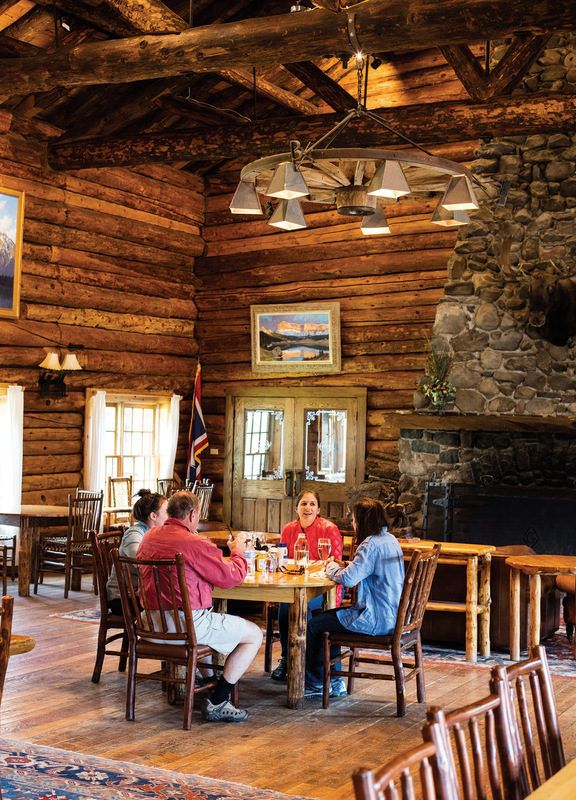 Guests enjoy three hearty meals each day in the historic dining room of Brooks Lake Lodge, where original fine art is juxtaposed with the log interior. Placid Brooks Lake fronts the historic lodge built in 1922 to house adventurous Easterners on their way to Yellowstone National Park. Brooks Lake Lodge & Spa guests experience a vacation customized to their interests. 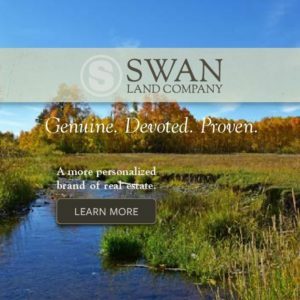 Fly fishing, horseback riding, fine dining and hiking head up the menu of activities. Guests often work up a healthy appetite after a day of adventuring on the ranch. The staff become like family to guests during a week-long stay at Brooks Lake Lodge. 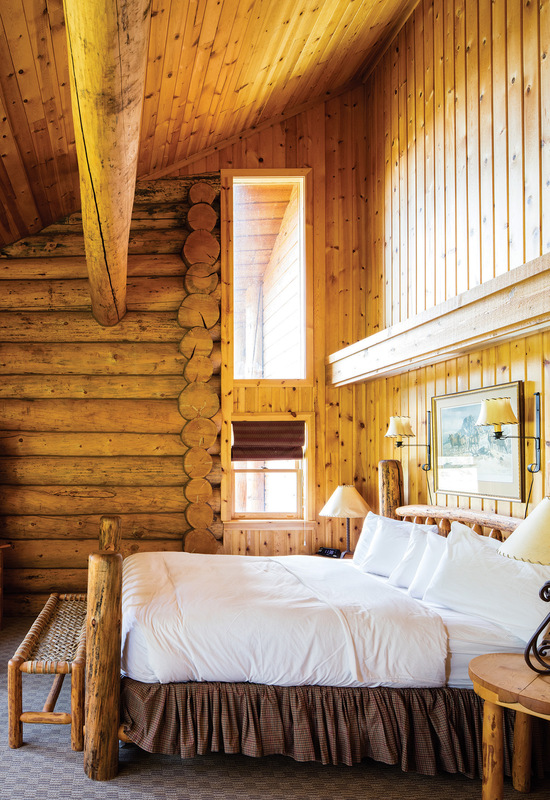 Daylight streams into a cozy log cabin guest room. 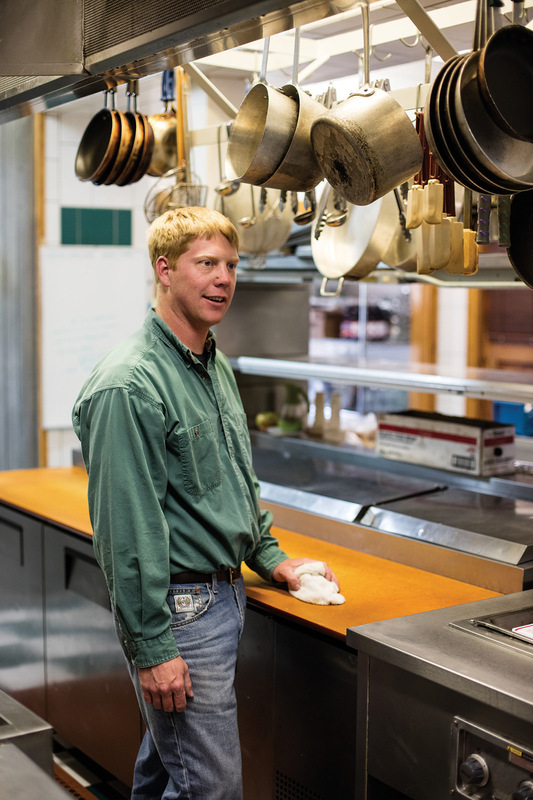 General manager Adam Long is always ready to accommodate guest needs or clean the kitchen if necessary, he’s the one who keeps Brooks Lake Lodge running smoothly year-round. The ultimate gathering place to swap tall tales of the day’s adventures or play a rousing game of shuffleboard, the Diamond G Saloon anchors guest activities. 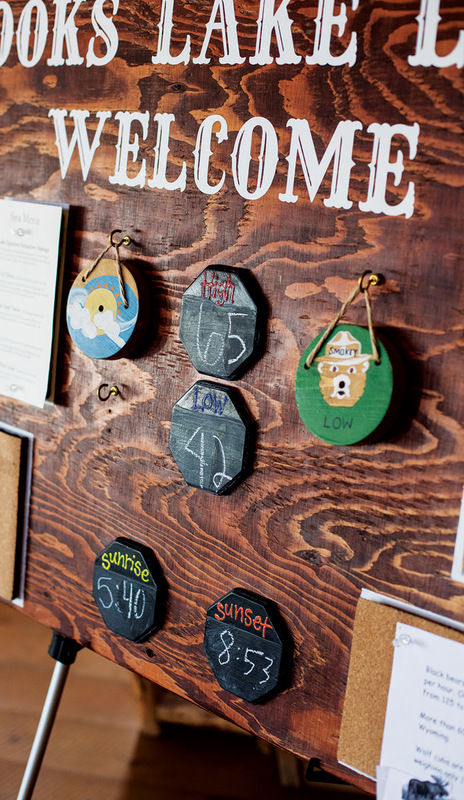 A nostalgic sign in the Diamond G Saloon lists activities on the property and offers a daily weather update. 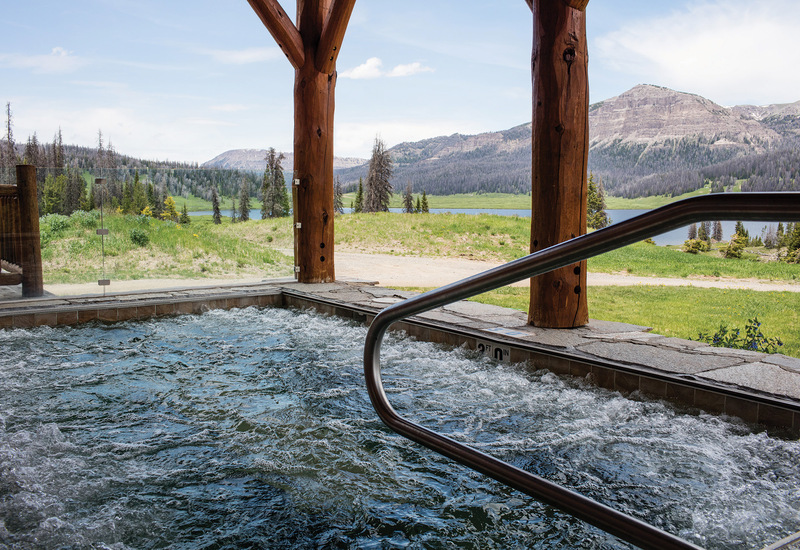 At Brooks Lake Lodge, a good soak leads to views of Pinnacle Buttes in the distance.